We supply restaurants with a range of quality cooking wood oak, and hickory. 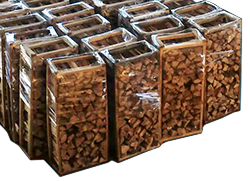 * For restaurants with wood burning ovens that use larger volumes of wood, we offer our premium oak, and hickory firewood. Oak is recommended leading wood burning oven for most manufacturers because it has a great flavor, and is a clean burning, gives a long hot and even burn. * We also can supply you with other cooking products and other specialty items such as wood chips and chunks, cedar planks and other wood related products. * All of our cooking woods and related products are available to our residential customers.